While pining for country music after our only country music station in Auckland was taken off air I decided to set up my own station using the Low Power FM frequencies while waiting for our government to release the communities frequencies that they have been promising for several years. When the work load was getting too much for me with my other business activities, namely FreeWheelingNZ.com, I asked singer/songwriter Ann Pascoe to help me. 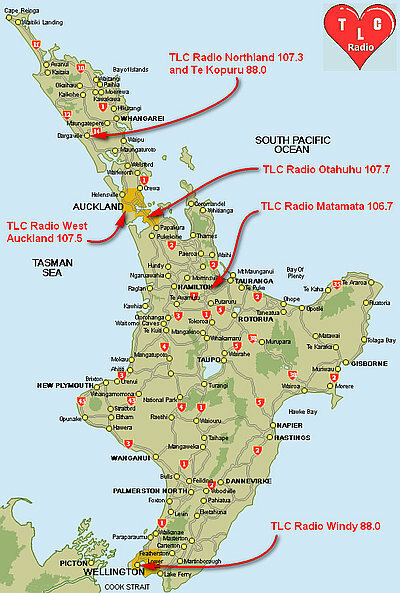 TLC Radio (The Little Country Radio station with a Big Heart) is a computerised radio station. And here Ann explains how it works, in her description of setting up the second TLC station in her area. "You're never too old to learn they say! (And some say you can't teach an old dog new tricks.) But learned I have. A little about radio frequencies, and low powered FM radio stations and programming CDs into mp3 files for a computer to play all day, seven days a week. And learning how a computer can be commanded to act as a radio presenter, using recorded voice messages, promoting artists, with even the time of day being accurately announced. This is programmed in between the tracks of music being played. So our computerised station doesn't lack personality! In fact listeners seem to think we are on site all day and all night! When as an independent artist, I sent my CD for airplay to TLC Otahuhu, and was accepted and put on the play list there. I was in email contact with Robert, and Friends Of Country Music. I made a comment about lack of country radio here, and that started the ball rolling. A lower powered FM frequency was secured, a transmitter and an aerial which would easily cover the Stratford township and further a field should listeners wish to buy their own FM aerial to access the community based station. Stronger frequencies FM and AM for the area are either not available, too costly or bought up by bigger stations wishing to keep airwaves to themselves. A suitable building was found, kindly offered by the Taranaki Back Packers Lodge, a building that was in former days, the Nurses Home for the local Stratford hospital. Space has been generously provided to house the computer and transmitter. Robert's TLC Otahuhu radio computer is in his specially built basement at his home. All equipment--computers, tranmitters licences and other expenses come out of Robert's pocket. We do it in our "spare time"; and have a living to make as well. So it really is a labour of love--for country music. In programming TLC Otahuhu and now TLC Stratford, getting play-lists ready for air, and handling emails for the radio stations, I have been introduced to a lot of country singers around the world, known as Indies. Country music does not get a fair hearing on New Zealand mainstream radio. The general public won't hear these people unless mainstream radio starts playing them, or more country radio stations set up. But just for love? Love might be great, but it doesn't pay the bills! It is amazing, the CDs that come in the post. Up to four or a five a week I am receiving already, and the Stratford TLC address is just new. All hopefuls like me, wanting air play, and hoping to catch an ear belonging to someone who might help them get ahead in the music business. Others just happy for their songs to be heard around the world. With the internet making communication easy, TLC radio generates a play-list, which is emailed to the artist, a general service from most stations playing 'indies', so they can see where their tracks are being played around the world of radio stations. It's looking promising for a third TLC radio station on air, in the near future. Meanwhile, I go back to the big box of multi CDs of artists' hopes and dreams, in bubble pack post packaging, or "Don't Bend or Damage" envelopes, post marked from all over the world, with attractive covers of the artist, their biographies and their songs, and listen to them as I programme and edit them for airplay, and wonder why the heck there is such a division between the big names of country music, and these independents who work hard to be heard."